How Far is Shanders Enclave? Shanders Properties believe that they are in the business of life, rather than property development - a core belief that has helped them continuously shape their thoughts, design, work culture, transparency and customer centricity. Shanders as a brand stands for blending the beauty and aesthetics of the contemporary with values that are nearly a century old. Their real estate division was established in 1983 and has till date delivered about 3 million sq. ft. Shanders Properties are exclusively focused on the South India market and have delivered and continue to work across big and small cities such as Bangalore, Chennai, Hyderabad, Mysore & Vijayawada. Their body of completed work comprises a fair mix of residential and commercial projects, though the former is their strength. Being one of the first developers in India to adopt environment friendly construction practices and as a founding member of the Indian Green Building Council (IGBC), they are committed to building spaces that address these concerns. Shanders Properties build affordable, high quality homes that cater to the growing urban upper middle income group, middle income group as also lower income group and fulfil a genuine housing requirement. At each price point, their homes deliver impeccably high quality and value. This translates into a great residence for personal use or a worthy investment for an investor's real estate portfolio. Shanders Enclave is a gated Villa Development in an area of 10 ½ acres, which is a part of the large mixed development on the proposed 75 meters Peripheral Ring Road in Phase 2, of Electronic City, towards South Bangalore. The location is also closer to Sarjapur Road and connects the eastern corridors of ORR, Marathahalli & Whitefield in Bangalore. The Location is cuddled up amidst the old and new economies, adjoining the RTO & BMTC Bus Depot, the whole-sale fruit market, schools of repute, closer to world class health care, nearer to the upcoming metro stations and a short distance away from the upcoming Hosur Airport & above all in a pristine surroundings with a clean environment. Extensive Landscaping along the 40 feet main driveway, graffiti and sculpture art work adorn the compound walls thus enhancing the beauty of the place. Enclave - offers an unparalleled Residential Villa Development in the neighbourhood of the Chikkanagamangala Lake, which are home to a few migratory birds. The recreational area has activity zone for the young and the old with well-planned indoor and outdoor games. On the anvil are a basketball court, tennis court, six a side football, bowling alley and cricket nets with Screening Wall & Amphitheatre are the other amenities. 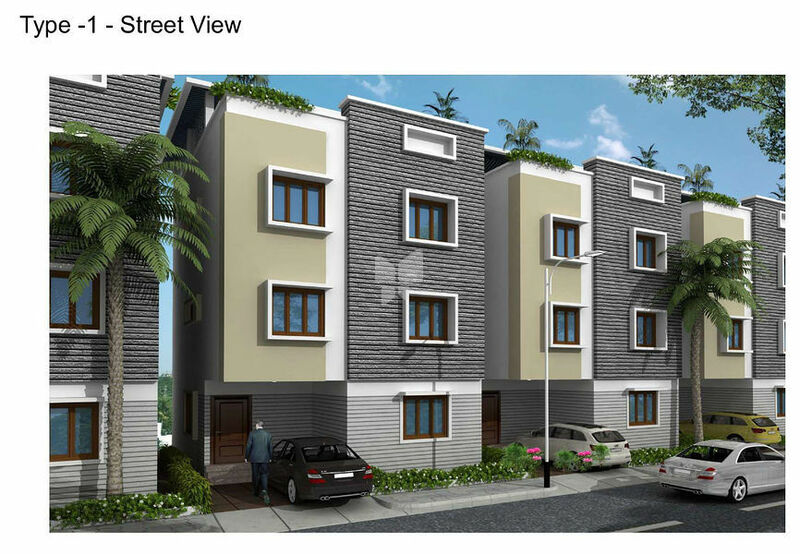 Two Variants are offered with a Plot Dimension of 1500 sq.ft & 1200 sq.ft. . The G + 2 structure shall have a saleable area of 3000 sq.ft & 2450 sq. ft. respectively. The property is approved by BDA & the complete development shall have 187 units. · Electronics City was conceived in mid-1970’s and today has become a major hub for IT & Manufacturing Companies, with approx. 200+ companies & 3+ Lakh Employees – It has become a very good location for Real Estate & Business to thrive. ·Dedicated industrial estates such as Bommasandra, Anekal, Jigani & Attibele has made Electronic City favourable for commercial businesses.